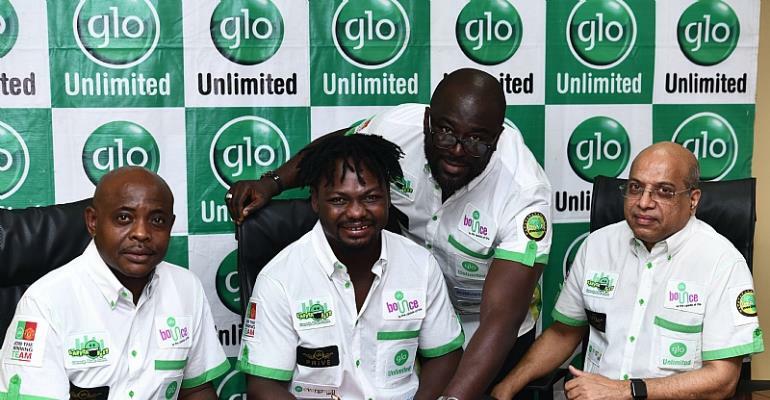 Ghana’s star boxer, Bastie Samir, has signed a deal with telecommunications operator, Glo Mobile Ghana, on the company’s new marketing campaign in Ghana. The deal entails his involvement in the company’s advertising and promotional efforts in Ghana over the next one year. This is a big boost to the boxer and indeed the popular boxing profession across Ghana. Bastie has acquired a deserved reputation as a focused and dedicated boxer of repute over the last few years. According to a statement from Glo, the engagement of Bastie bears eloquent testimony to the company’s continued commitment to working with hard working professionals to reach higher in the pursuit of excellence. Glo Mobile has always been a strong supporter of sports, art and entertainment across the continent and has demonstrated its belief in the limitless ability of young professionals to reach the top of their game. In his words, Bastie disclosed his readiness to work with Glo as this will also enable him to connect with his fans and millions of other Ghanaians and inspire younger elements to reach for their dreams, despite the odds. Born May 19, 1986, Samir has had a bright career propped up by hard work and discipline. He was the champion in the welterweight division in the African Amateur Championships in May 2007 and also represented Ghana and won silver at the 2007 All-Africa Games boxing welterweight division He qualified for the Olympics 2008 in the light-heavyweight division. 31-year-old Bastie is nicknamed “The Beast” for his impressive record of knocking out all his opponents in his 15 bouts. He has had just one draw in his career so far. In October 2017, he tainted the 28-0-0 record of the famous boxer, Bukom Banku with a knockout.